CVS Shoppers, its your lucky day! Hurry up and check your email. 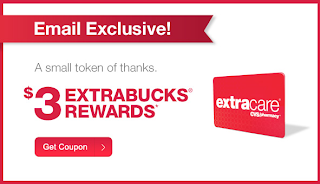 Many of our readers are reporting a random $3 Extra Care Bucks for FREE! I'm taking this to CVS this week to put with some coupons and saving BIG!